See Corey Haim before they were famous! Corey Haim makes an early career appearance as "Jeff", C Thomas Howell's little brother in the movie. Secret Admirer is another classic 80's teen romantic comedy that is much more than the sum of it's parts. It revolves around the age old tradition of teen love letters --and what would happen if an anonymous one found it's way into the adult world. The confusion that one letter could cause between poor, unsuspecting married men and women and the trouble it would cause as a result is seemingly limitless! 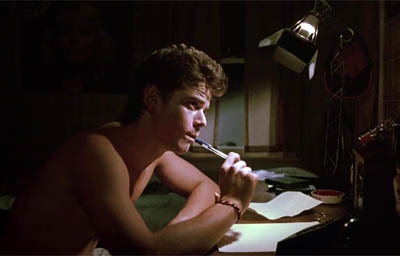 Michael Ryan (C. Thomas Howell) is infactuated with Deborah Anne Fimple (Kelly Preston), so when he finds an unsigned letter in his locker, it's not too hard for his buddy Roger (Casey Siemaszko) to convice him, after reading it aloud, that it's from Deborah -even though Deborah has actually been dating Steve (Scott McGinnis), an older fraternity boy at a local college. Later, Michael corners Deborah at a frat party, but when she doesn't react to his advances despite extracts from the letter, he decides that she couldn't have been the author. His girl buddy Toni (Lori Laughlin) later suggests that he write Deborah a letter himself, but his effort is so pitiful that Toni rewrites it totally before giving it to Deborah. Meanwhile, the original letter starts to cause a whole series of misunderstandings. At the Ryan breakfast table, the letter is accidentally placed in a textbook for a business class that Michael's dad, George (Cliff De Young) is taking from Deborah's mom Elizabeth (Leigh Taylor-Young) at night school. Also, Michael's mom, Connie (Dee Wallace Stone), also reads the letter and worries that he is having an affair with Elizabeth. When George discovers the letter at class that night, he thinks that Elizabeth has a crush on him! Just to make things worse, Deborah's dad Lieutenant Lou Fimple (brilliantly played by Fred Ward) also discovers a letter that Michael wrote to Deborah and thinks that Elizabeth is cheating on him. The four adults pair off in opposite couples, each thinking that the other is either in love with them, or cheating on their marriages. All this of course is cringingly hilarious (and the excellent actors obviously have a ball doing it!) but it does leave the central question un-answered... who wrote the original letter to C. Thomas Howell??? Who is the "Secret Admirer"...?? As far as most mainstream critics would be concerned, Secret Admirer is yet another silly teen movie with a silly premise and silly people. However that "crusty" view of the film completely ignores the one thing that the movie is good at... Entertaining. It's as true for this movie as it is for other classics of the genre like "Can't Buy Me Love", "License to Drive", "Some Kind of Wonderful" and many more. These movies entertain us in a totally unselfish, un-self-concious way. They are not made to be analysed, just enjoyed. The actors are clearly having fun and, in particular, Fred Ward's character, Lieutenant Fimple is a show stealer!